We are going to spotlight some GnR auctions this time around. Just to get the “appetite” wet, let’s look at….. Guns N’ Roses – Lies sealed in longbox ends at $110.29! I can easily get my hands on one of these and I think it’s high time I went out and got it. I have seen LIES in a longbox at a local shop for the last 6 years, it just sits there collecting dust at $15. This seller, Zenguitar, has over 2300+ feedback and this auction received 10 bids with a start price of $7.99. I still don’t get the idea of having a sealed longbox, it’s a new niche in CD collecting though. This is just the tip of the iceburg when it comes to GnR CDs on Ebay recently. People are selling rare and common GnR CDs for high prices, some sellers are doing to it exclusively just like this one: cdlewis (New Jersey, USA) with 1164 feedback. Keep in mind that the following five auctions all ended on October 20, 2007 between 1:11pm and 1:22pm, we’ll do a breakdown at the end….. 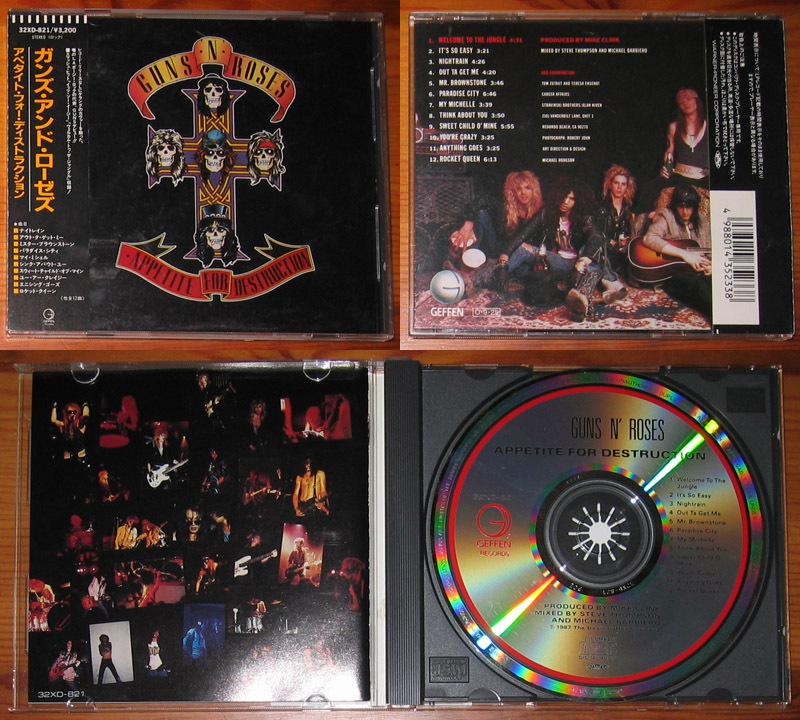 Guns N’ Roses – Appetite For Destruction (Japanese CD 1st pressing) ends at $100! Very detailed auction, good closeup photos, and the OBI strip…..a very attractive item for collectors. I like that the seller included the serial number, collectors know these things. Started at $9.99 and had 21 bids. 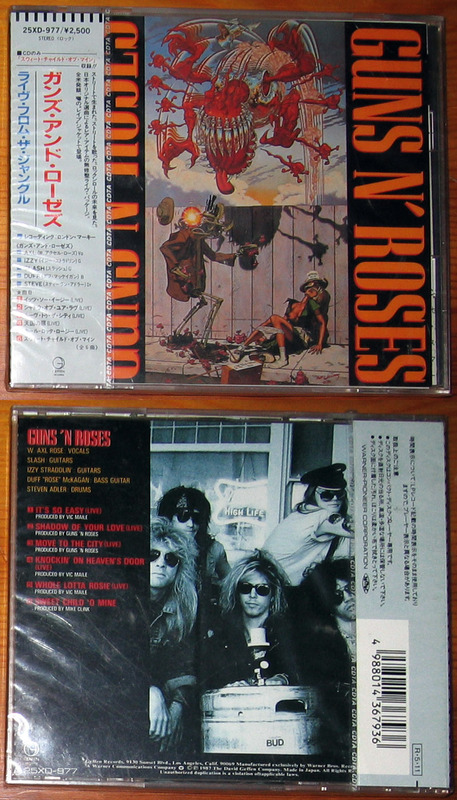 Guns N’ Roses – Appetite For Destruction (1990 Japanese CD with original artwork) sells for $100.99! This seller is on a roll! Another Appetite CD, another $100! Very detailed again with the history behind the pressing, good closeups again but no OBI strip. The Japanese lyric sheet is included though. Started at $9.99 again and had 13 bids. 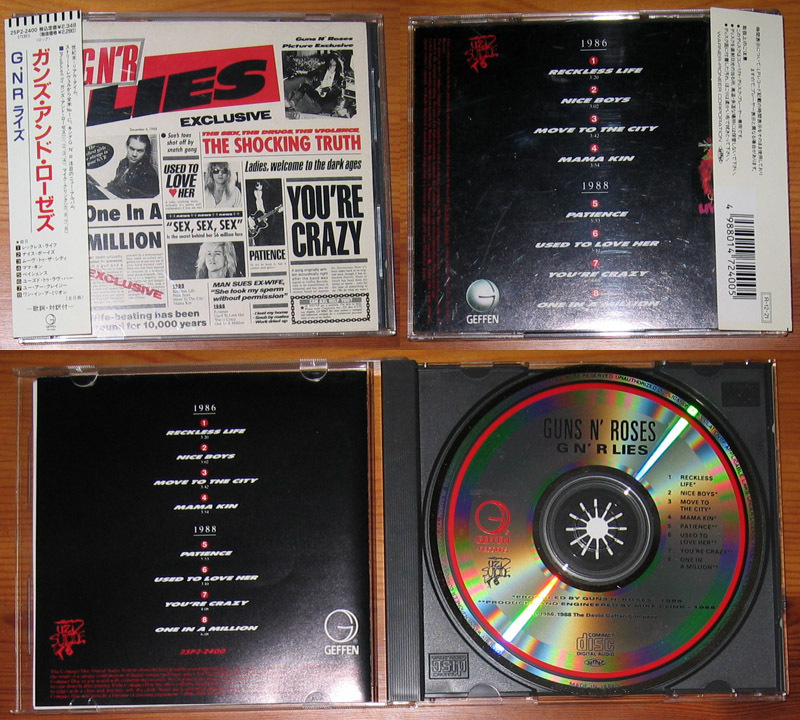 Guns N’ Roses – Lies (1988 Japanese CD 1st pressing) sells for $113.49! I like this seller’s auctions, they are very good. Detailed again, closeups again, OBI again…..this guy seems to know his GnR pressing. $9.99 start price again and 7 bids but what I noticed is that the winner won the Appetite original artwork disc and was 2nd place on the Appetite 1st press CD. That’s a lot of money for winning two discs! 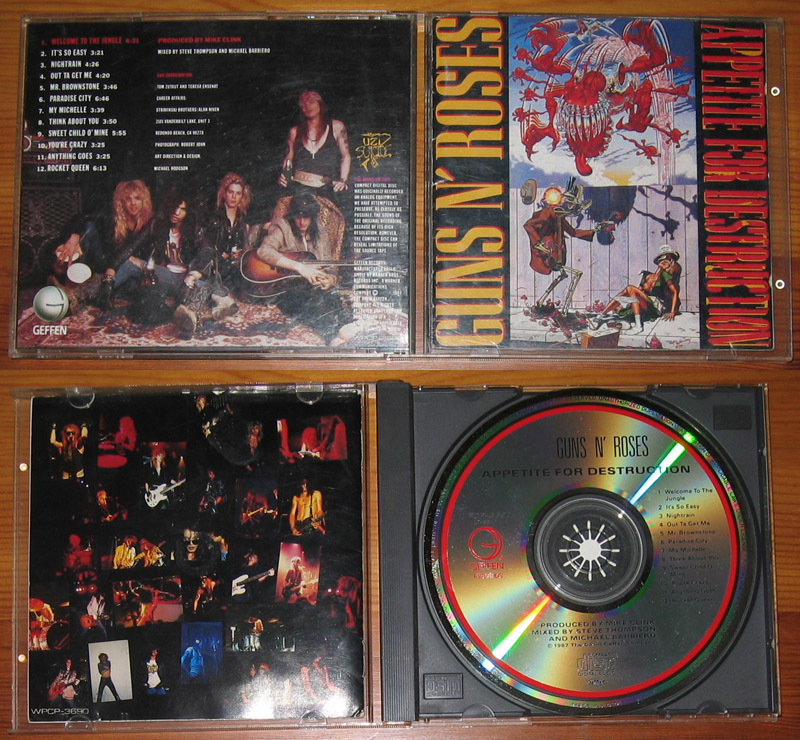 Guns N’ Roses – Live E.P. (1987 Japan only CD) still sealed and commands $416! I’ve seen this disc go for high dollars but I haven’t seen it go this high in years! Reason? 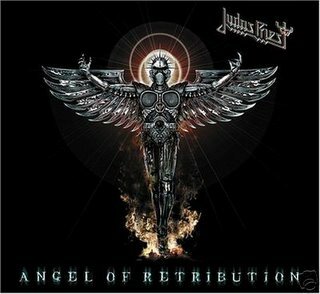 A bidder with zero feedback and on Ebay less than 30 days bid this CD way up. Is it a case of shill bidding by the seller? Maybe, maybe not…..it’s possible that the seller is going to be a victim and not get paid if the winning bidder is an actual person. Still a great collector’s find. This auction started at $9.99, had 23 bids, and the suspect winner started the price war around the $150 mark. 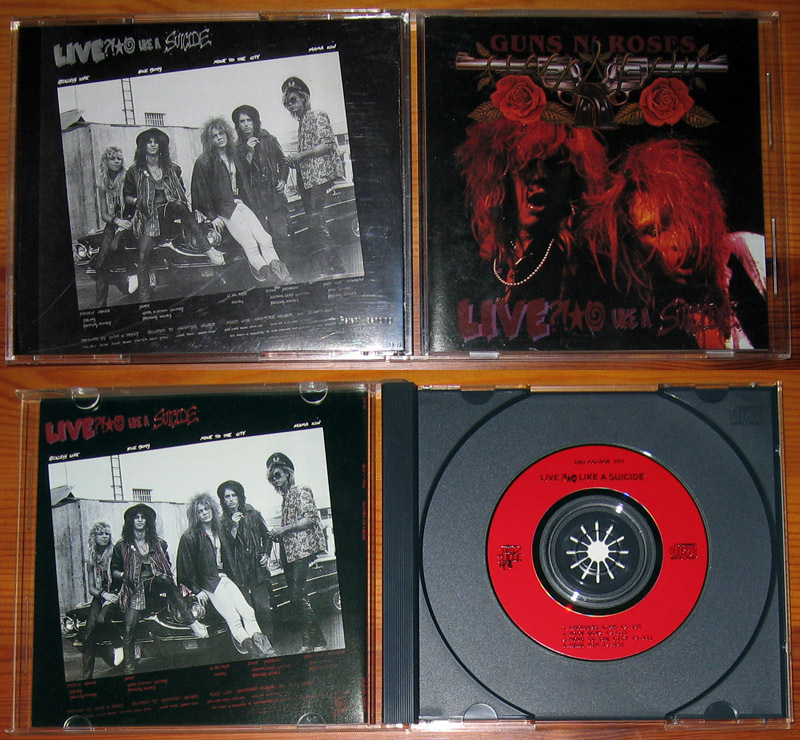 Guns N’ Roses – Live Like A Suicide EP. (Japan 3 inch CD bootleg) grabs $455.23! Let’s get this out of the way: this is NOT an official release. Read that again: this is NOT an official Uzi Suicide label release. So the same seller has a Japanese boot of the vinyl E.P. on CD and it gets over $455…..or does it? The same winning bidder that one the Live E.P. (above) is the winner on this auction too. This CD started at $9.99 like the others, got 34 bids, but this winning bidder started early at $25 and jacked up the price. If you compare both auctions, the bidders list has the same bidders on it except for a couple. Shill bidding, auction bots, or coincidence? For the sellers sake, I hope he gets his $455.23. 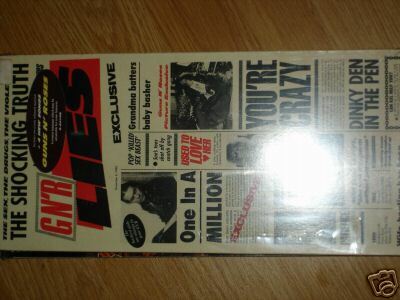 Hey, I’ll buy the sealed Lies longbox that is at a shop near you if you can get it? I was actually the second highest bidder on that item you have listed which helped jack the price right up to where it finished. I was actually thinking that bid would easily make me the highest bidder and I would pick it up for less than that – but hey, someone obviously wanted it more than me.